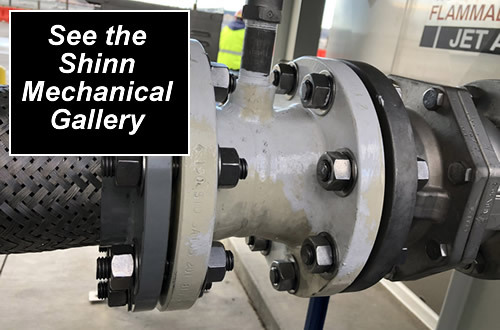 Case Study - Shinn Mechanical, Inc.
Shinn Mechanical Inc. located in Kent, Washington is an industrial pipe fabrication shop and mechanical contractor, serving companies throughout the Pacific Northwest completing commercial, industrial and municipal projects. 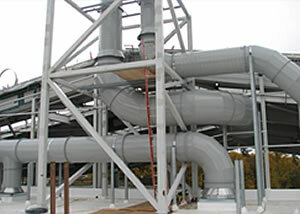 The company delivers quality fabrications for Hydronic Piping, Steam and Condensate, Natural Gas and other Fuel Storage and Distribution, Compressed Air, Medical Gas Piping, Building Information Modeling (BIM), and more. 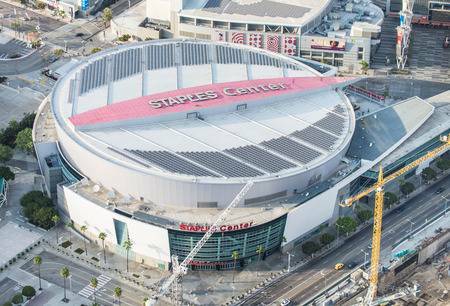 Shinn is known for getting projects done quickly with high-quality work, completing 1,994 orbital welds on 70,000 ft. of pipe on the floor of The Staples Center in Los Angeles in just 10 days. 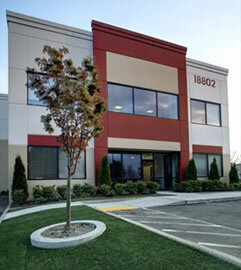 A few years ago Shinn Mechanical moved into a new 30,000 sq.ft. facility and purchased a computerized pipe cutting solution. 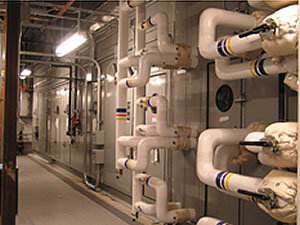 They wanted to increase the quality of their fabrication, improve lead times, and lower their production costs. 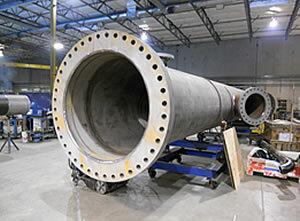 Fabrication projects faced increased need for beveled holes which demanded a pipe cutting machine with multiple axes on the cutting head. "With the projects we were landing, the types of pipe we are cutting, and how we needed to cut pipe-laterals, branches and everything else - it just made sense to purchase a CNC cutting machine," said Mike Shinn, President of Shinn Mechanical. Shinn purchased the Watts-Mueller W-364: a computerized, four-axis pipe cutter which handles up to 36 inch pipe. They also modified the W-364 with a 40 ft. table to accommodate larger projects, added a conveyor and lifting capabilities to keep pipe rolling in and out. "In our old shop," continued Mike, "we would handle pipe anywhere from 14 to 16 times. The new automated system is cutting down handling pipe to four or five times. Anytime you handle the material, it takes longer and increases costs." One project required two cuts for fitting a 12" pipe onto an 18" pipe. 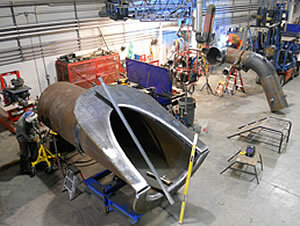 Using the Watts-Mueller W-364, Shinn fabricators were able to complete the cuts quickly and accurately. "There was no human error," said Mike. "There was no need for a worker to make measurements. All the commands were entered into the computer-generated cutting table and all cuts were made, end-to-end automatically with minimal cleanup. It took 10 to 12 minutes from start to finish - by the time we loaded the pipe on the table, clamped it and punched it in. Laying it out manually, cutting it and cleaning it up would have been a two-hour process." Mike Shinn worked in the piping trades and received the honor of UA Local 32's Steamfitter Apprentice of the Year and finally reached the level of superintendent before starting Shinn Mechanical in 1994. He is a recognized innovator, has a gift for assessing projects and developing unique, efficient solutions to complex issues. 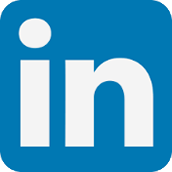 Mike has held many leadership and committee roles with professional industry organizations. In addition, he was the 2012-2013 MCAWW President. 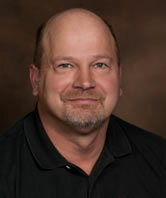 Mike also regularly assists and promotes the Construction Management programs at Central Washington Univ., Univ. of Washington, and Washington State Univ. 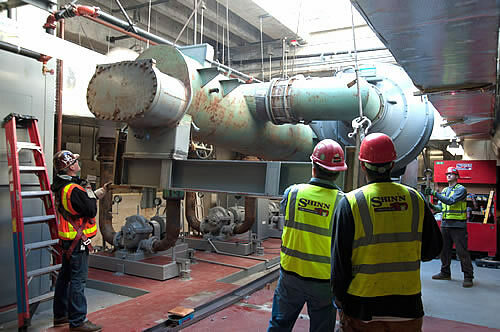 In addition to the reduction of manhours, Shinn Mechanical's choice to upgrade the Watts-Mueller equipment to a 40ft. cutting table was made with efficiency in mind. The longer cutting table helped reduce unnecessary welds on larger vessels. "The simplified, menu-based interface using the Watts-Mueller 3D Software gives us the ability to save multiple cut patterns on the database," said Mike Shinn. "The operator can program a variety of cuts, including T's, full Y's, K's, miters, straight cuts, slots, rectangles and a variety of saddles - then just hit Submit. The Watts-Mueller machine runs through the cuts in minutes rather than taking hours to lay out and draw the cuts on the vessel. The tolerances using this machine are within 1/32 inch, which is closer than the required specs for almost all jobs."